Two Israel-based providers of electronics components have collaborated to provide solar-energy harvesting technology that can power wireless sensors so they require little or no battery power to operate.Sol Chip and Cellergy are offering a high-performance energy harvester that combines Cellergy supercapacitors and Sol Chip’s solar-energy harvesting technology and can be integrated into a range of devices and applications to provide power for short-range wireless communication. The companies envision the technology being used to enable the so-called Internet of Things in which devices can identify and communicate with one another over the Internet or a network. These devices will be used in a number of industries, including agriculture, smart lighting control, smart water management, environmental monitoring, medical, security, and safety. The Everlasting Solar Battery — Sol Chip’s contribution to the collaboration — addresses the needs of remote or mobile devices that operate autonomously by prolonging battery life, reducing environmental hazard and improving battery-charging technology, Zack Sharon, Sol Chip’s sales and marketing director, told Design News. “The technology harvests light energy to extend battery life or replace batteries in many applications and reduces system overall cost,” he said. 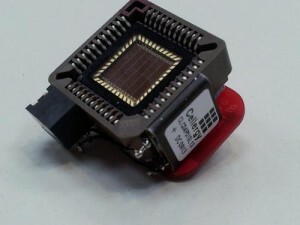 The Sol Chip device is essentially a single-chip solar cell with integrated battery management and charging circuitry. The device can recharge batteries or charge super-capacitors, and has a patent-pending architecture that provides higher efficiency with an extremely lean and cost saving implementation, Sharon told us. The harvester combines the Everlasting Solar Battery with Cellergy’s supercapacitor technology to store the energy, which allows for more energy storage than typical capacitors. Energy harvesting is becoming a method of choice for low-power devices that typically run on batteries but don’t need a lot of energy to power them. A number of semiconductor and electronics components companies are building ultra-low-power components or micro energy-harvesting devices that can be embedded in devices like medical sensors, smoke alarms, security systems, and other devices. According to Sharon, the addressable market for the Sol Chip-Cellergy technology is estimated at 1 billion units in 2022, with many segments growing more than 10 percent per year. “Initial target segments include wireless sensors and wireless sensor networks, smart power grids, smart cities, and active RFID,” he said.